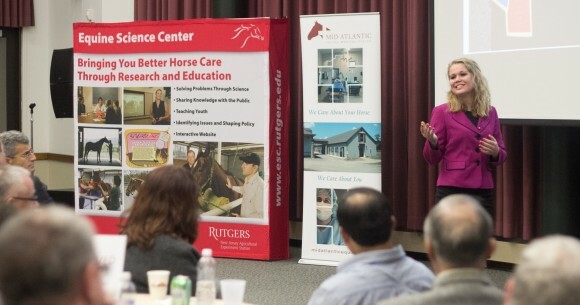 Share the post "Lifelong 4-Her’s Journey Brings Her Full Circle to Rutgers"
Kristen Johnson spoke about the importance of the ImPACT test to the horse industry at the Equine Science Center “Evening of Celebration and Science.” Photo courtesy of Tiffany Cody, Equine Science Center. For those not well acquainted with the 4-H Youth Development Program, they may think a typical 4-H’er doesn’t journey much beyond their county fair. That’s a common misperception. Just ask Kristen Johnson (SEBS ’17), a seasoned member of the 4-H program at Rutgers Cooperative Extension of Somerset County. Kristen’s involvement in 4-H has taken her to many places across the U.S. and beyond: Georgia, North Dakota, Maryland, Washington, D.C., and Russia. Her 4-H journey has brought her full circle, in a way, leading her to the Rutgers School of Environmental and Biological Sciences where, as a freshman, she is participating in her final year as a New Jersey 4-H’er. Kristen’s 4-H journey also recently landed her at the podium of the annual Rutgers Equine Science Center event, “An Evening of Celebration and Science,” held last November to celebrate achievements in equine scientific research, and the accomplished individuals and organizations deeply involved in New Jersey’s equine industry. The event also celebrated youth equine education and programs, and as the winner of the 2013 National 4-H Roundup Public Speaking contest, Kristen had the unique opportunity to present her award-winning speech. A lifelong 4-H’er, Kristen has many achievements and activities under her belt, including being a “horseless” member of the 4-H Horse Club. She recently took time from her busy schedule as a full-time SEBS student to answer some questions on her 4-H involvement and what brought her to the school. Q. Tell us about your experience in 4-H. How many years were you involved and what activities did you do? I’ve been in 4-H for 12 years. I started in a horse prep club called Chaps N’ Spurs. Then when I was old enough, I joined the regular club where I went on to become president through my four years of high school. I also joined the goat club, sheep club, exchange, and a general livestock club. I was a junior representative in my county’s 4-H association. The exchange club is where my club matches with an exchange club from another state. For one year, we host them and show them New Jersey then for one week the following year, we stay with them and see their state. I also traveled to Russia in an International 4-H exchange program in the summer of 2013 and then also hosted a Russian 4-H’er. I participated in the market lamb program throughout high school. I did the three National 4-H trips including Congress, Conference, and Citizenship Washington Focus throughout high school. Q. Is there a special memory of a 4-H activity that you’d like to share? One of the most influential experiences I had in 4-H was the exchange program in North Dakota. This trip was the first time I left the East Coast and my eyes were opened to how other people live in our country in a close and intimate way. I stayed on a farm for a week with a great 4-H family. I saw the benefits and disadvantages of farming as a livelihood. I saw that even though they had a different way of life than my family and I, we still laughed about the same things and had a lot of similar experiences. It was interesting to see the North Dakotans’ observations about New Jersey when they came here and it made me see my own state in a different way. Kristen Johnson at the Eastern National 4-H Round Up Competition where she won the Public Speaking contest. Photo courtesy Carol Ward, Somerset County 4-H agent. Q. How does it work being a “horseless” member of the 4-H horse club? I started 4-H in a horse club but have never owned or even leased a horse, yet never felt excluded. In some ways, not owning a horse led me to engage more in the educational events associated with the club: horse bowl, hippology, horse judging and public speaking. Being in a 4-H livestock club is so much more than actually working with and showing your livestock; that is only one aspect of 4-H. 4-H also includes community service, leadership and public speaking. I have participated in other events too in the club, on county, state, and national levels. You can’t let not owning an animal hold you back from all the opportunities 4-H has to offer you! Q. How has 4-H impacted your life? 4-H has molded me to become who I am today. I learned a plethora of life lessons through 4-H like responsibility, dedication, and leadership skills. I met a great group of kids and adults that are very passionate about what they do. I was swayed to come to Rutgers because 4-H connects kids with Rutgers! Q. Did your participation in 4-H influence your decision to attend Rutgers or your choice of major? Definitely, I decided on Rutgers from my years of participating in different 4-H competitions, seminars and workshops. I met Rutgers professors and students and loved the energy and passion that I saw coming from the campus. I wanted to be a part of it! I wanted to become an environmental science major because I became interested in the relationship between agriculture and the environment. Q. What is your major at SEBS and what are your career goals? I am an Environmental Policy, Institutions, and Behavior Major. 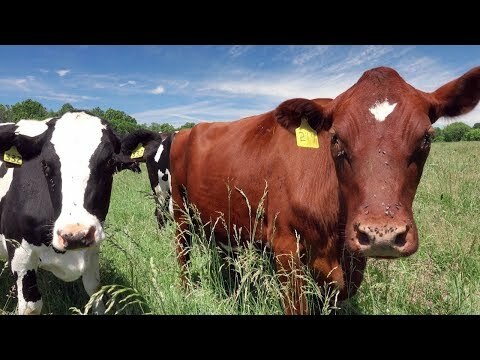 I have an interest in feeding a growing population. Q. What was your speech about for the 4-H Public Speaking Contest? 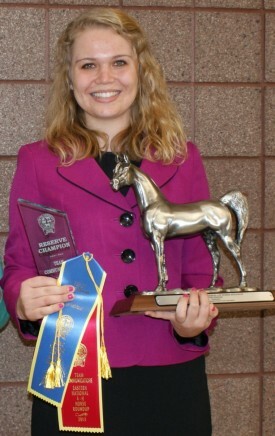 Tell us about your award and presenting the speech for the Rutgers Equine Science Center event. I did my speech on ImPACT (Immediate Post Concussion Assessment and Cognitive Test). It is a computer-generated, neurocognitive test that can measure the effects of a sports-related concussion and track the recovery so you will know when your brain is healed. I advocated for the test to be taken by all 4-H’ers in the horse division. I presented in the National Roundup competition in Kentucky and won my division (Public Speaking: Individual speech with no props). The New Jersey presentation team collectively won second place. I presented my speech at the Equine Science Center event in order to get word out about the ImPACT test to the horse industry and hopefully convince more people to take the test so we can keep horse enthusiasts safe in New Jersey and around the country!